The Board of Veteran CEOs: Can You Unlearn the Addictive Behaviors You Learned? inherit habits that can sabotage the best planned efforts. In a previous article, I wrote about addictive behaviors that have been passed down for eons from one generation to the next. In this article, I would like to discuss how to rid yourself of those self-inflicting habits. Like all habits, they are believed to be hard to get rid of. You have been indoctrinated with the idea that change or transformation is difficult. Yet, every cell in your body is replaced in seven-year cycles. That in itself implies human beings were designed for transformation. Nevertheless, you inherited the belief that change is HARD. Because so many say it, you believe it’s a fact of life. That is analogous to believing the earth is the center of the universe. At one time, the most educated scientists believed the earth was the center. Copernicus questioned that and made new discoveries. While it seems odd to be addicted to a mindset, it appears to be so. If you ask a person to stop believing something, they will most likely debate and defend to prove their belief is correct. That is what happened to Copernicus when he told scientists that the sun was the center of the universe, not the earth. An example of how this is done in every day life is the following: if your parents have always told you that life is difficult, there is a good chance you are stuck with that thought. Furthermore, you would have most likely gone out of your way to prove that that philosophy is correct. If you encountered a situation that was easy, you would say it was just luck. If someone told you to stop believing life is difficult, you would rather trust your parents. And you would be as addicted to that thought as an alcoholic is to vodka. Like the alcoholic, you would have to confront you are addicted to a belief that you can’t stop believing, even when you want to. Also like the alcoholic, you would have to confront that you have made life difficult when it wasn’t. More importantly, you will have to distinguish every time you say to yourself that something will be difficult, hard, impossible, someone will not let you, etc. When you distinguish those conversations that have been stored in your brain, you will realize that the voices are not yours. They belong to your parents, siblings, friends, movies, etc. Once you distinguish those voices, you have a choice. You can continue to follow them. Or you can choose a new conversation that you will create. This time it will be one you crafted, instead of an inherited belief stored in your brain. Those outdated beliefs can be like mines in a minefield. Every time you hear those beliefs, they can sabotage your personal or professional life. Once you have the distinction called “inherited beliefs”, you will begin to see you have a plethora of beliefs you are addicted to. What’s worse, no one ever asked you if you wanted those conversations stored in your brain. They simply imposed them on you. 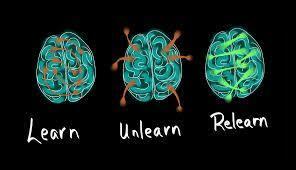 Distinguishing imposed beliefs empowers you to unlearn them. 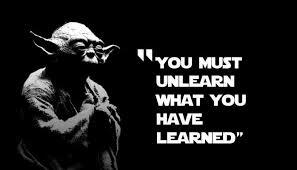 As you unlearn them, you also have the power to pass on the unlearning knowledge to the next generation. That way they are not stuck with self-sabotage beliefs that damage some of the best careers or marriages. They will have the freedom to choose and store conversations in their brain that allow for an empowering and fulfilling life. Unfortunately when we face a hard situation we tend to be more willing to change...sometimes you need of the hard times to change a bad behavior. Do you value self hypnosis for improving pathways, in general?